A wishing well is a unique decorative element for your garden or lawn. When you start looking at the available designs, you might notice that round designs are more common than square designs. Using a square planter as your base gives you the basic shape of the wishing well. Once you have the base, you just need to make the small roof that attaches to the top and decorate the sides, making it look more like a real wishing well. A square wishing well adds a cheerful touch to your lawn. 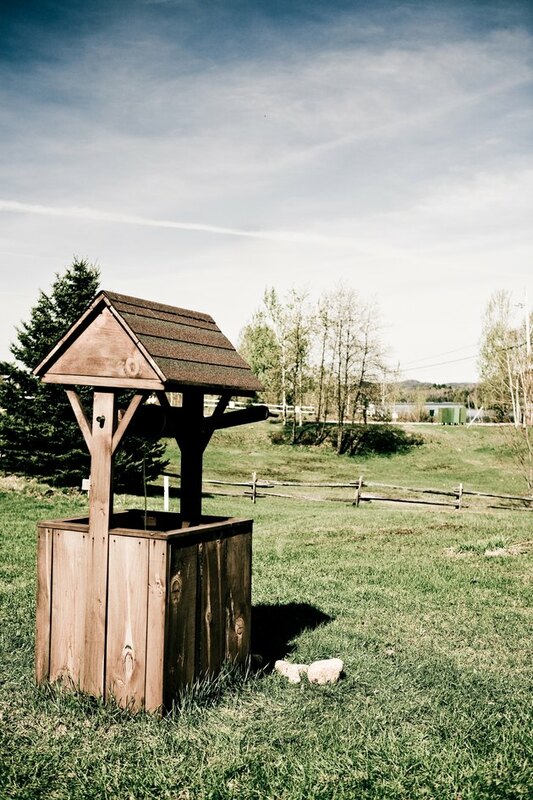 Pick a location in your yard for the wishing well. Set the square planter on the ground and trace the outline of the planter with a shovel. Remove the planter and remove the top layer of soil from the ground with the shovel. Spray the ground with water from a garden hose and lightly pack the ground with your hands before setting the planter back on the ground. Lay pieces of pressure-treated lumber on the ground. Measure the length and width of your planter and cut the lumber into the same width and length with a circular saw. Hold the saw at a 45-degree angle and run across the ends of the wood, creating a mitered edge. Place the lumber around the edges of the planter. Add a second layer of wood and attach to the bottom layer with nails from a nail gun. Stack additional layers of wood and nail each layer to the wood underneath until the wood reaches the top of the planter. Set a 3/4-by-12-by-12 wood board flat. Arrange four 3/4-by-2-by12 wood boards on top of the board and attach together with 1-inch wood screws. Use two wood screws on the end of each board, affixing it to the board underneath. Repeat this step with the remaining boards and set to one side. Insert a 2-by-4-by-36 board inside the planter and press it against the side. Hold your nail gun against the back side of the board and shoot a nail through the wood. The nail should go through the board and planter and into the outside of the well. Repeat this step with a second board across the well. Lean the boards you made in Step 4 against the top of the wishing well. Attach the boards to the wishing well with your nail gun. The nails keep the boards from slipping and finishes your wishing well.